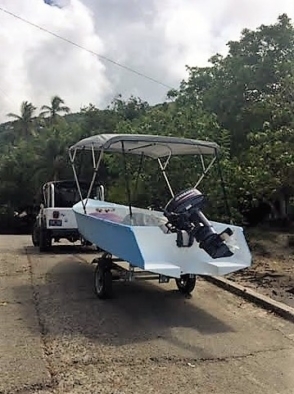 Without a doubt, the Tango Skiff’s most notable visual element is its transom extensions. Designer Hank Bravo incorporated them into an early boat to address the “squatting common with small, outboard powered boats making it easier to get on plane.” The result is the design we know today. Both from a functional and aesthetic perspective, the transom extensions were definite factors in my decision to build the 17′ version. It is a striking look. But as I’ve gotten further along in the build, I’ve wondered about water access. While a conventional transom makes adding a swim platform a relatively small effort, the unusual Tango Skiff’s stern does not. With the transom area seemingly out of consideration, I focused my search on bow ladders and gunwale ladders. Long story short, each has its pros and cons. A bow ladder could work but its located at the least stable point on the boat. 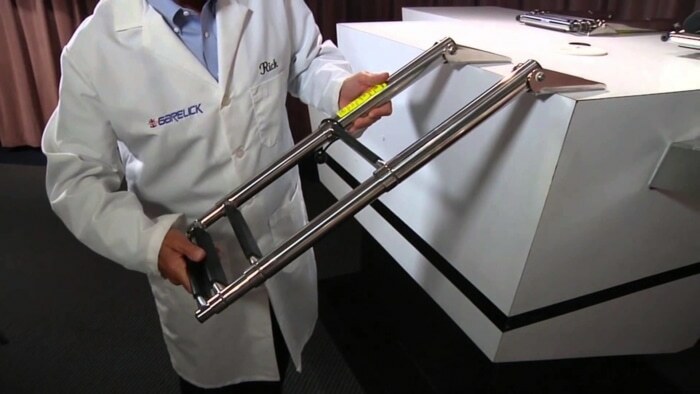 Further, the ones that might work – ones that would lay flat on the breasthook – are $400 to $500. A gunwale ladder could work but I didn’t like the idea of having to store it when not in use. It’s a small boat and I didn’t want to take up precious space. So while interesting, the search wasn’t entirely satisfying. While intriguing, I couldn’t help but think that this swim platform (step) couldn’t possibly be strong enough to handle being a planing surface. Unfortunately, I had no way of contacting the builder for input. Finally, I stumbled across the answer in an article on Small Boats Monthly. 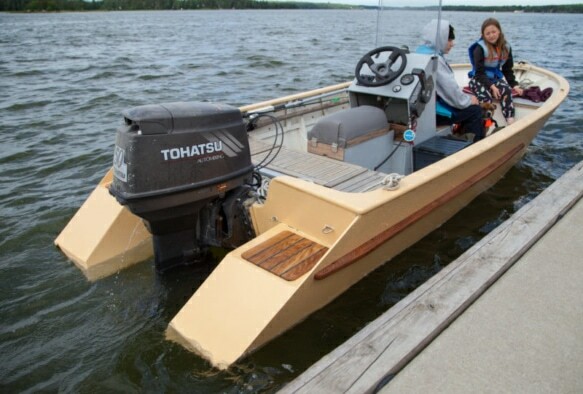 While looking over the transom extensions on the Tango Skiff, Mats Vuorenjuuri thought a similar design could mitigate some of the faults he found in his own 14’9″ skiff. His solution took the diagonal profile of the Tango while incorporating a substantial swim step into the extension. Thank you Mats for showing the way. The Tango build plans call for 9″ access holes through the transom to allow inspection of the extensions. Keeping in mind that these need to fit the space under the rear seat, I was concerned about removing this much material so close to the bottom edge of the transom. I looked at 7″ access ports but I felt even these removed too much. Thankfully, I hemmed and hawed long enough that I never cut out those access holes. By adopting Mats’ design, I’ll have an inspection hatch in the extension’s swim step rather than through the transom. I’ll sleep better knowing I didn’t compromise the transom’s integrity while ending up with some additional storage. While I’m currently focused on getting the rear bulkheads sorted out (post coming), I’ll mock up a design in cardboard and publish it. I don’t expect it will deviate too far from Mats’ concept but I would like to consider adding a swim ladder to at least one transom extension. This would not only make swim access more pleasant but address man overboard concerns. 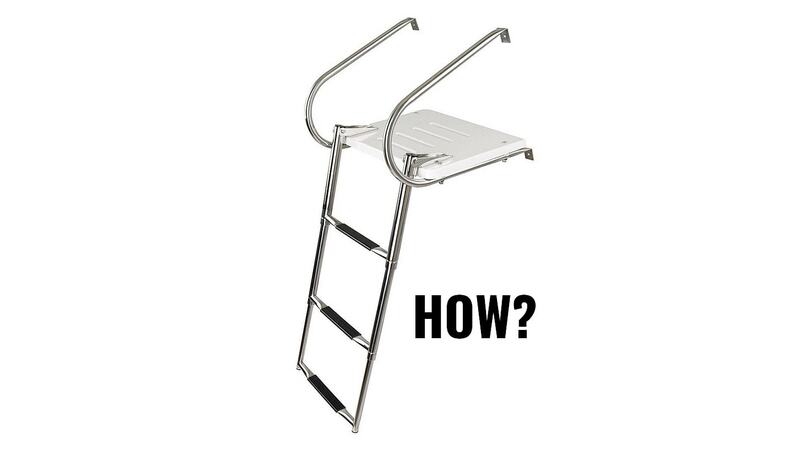 Something like this four-step swim ladder might work or maybe a telescoping dive ladder. I’ll have to consider which makes more sense.